Yep, you read the title of this post correctly! I’m going to show you a knockout recipe for the old favourite of mushrooms on toast. With the addition of bacon, garlic, herbs and a dash of creme fraiche the humble dish of mushrooms on toast is transformed into something quite special. Add a simple dressed salad and it’s a great mid-week meal that’s both quick and super simple. If you wanted to make this veggie, you could of course leave out the bacon. I like it because, well, everything is better with bacon! I tend to use either rosemary or thyme as the herbs for this, but you could by all means experiment if you particularly like the flavour of others with your mushrooms. You could even go crazy with lots of different wild mushrooms; that would make for an extra special dish perhaps as a starter at a dinner party? Try this ‘pimped up’ mushroom recipe for a mid-week dinner. Super simple and super delicious in equal measure. 1. Fry the bacon on a medium heat until it’s just starting to go light brown and is cooked all the way through. 2. 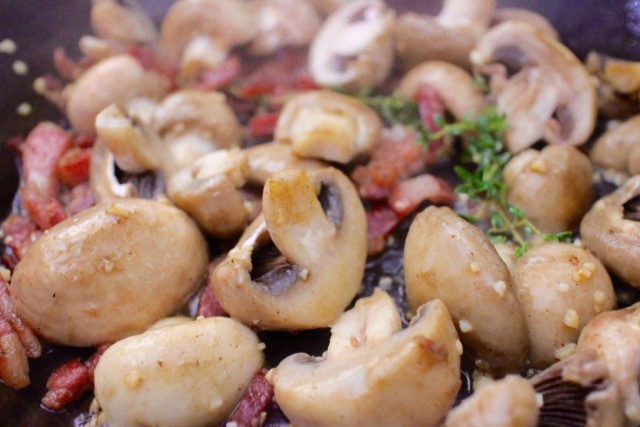 Add the mushrooms, garlic and herbs and continue to fry until all ingredients are cooked and soft. Try to start toasting the bread so it’s done just as you need it. 3. Take the pan OFF the heat and add the crème fraiche, stirring to coat the mushrooms. If you add whilst on the heat, the crème fraiche may split. It will still be ok to eat but won’t look very nice. 4. 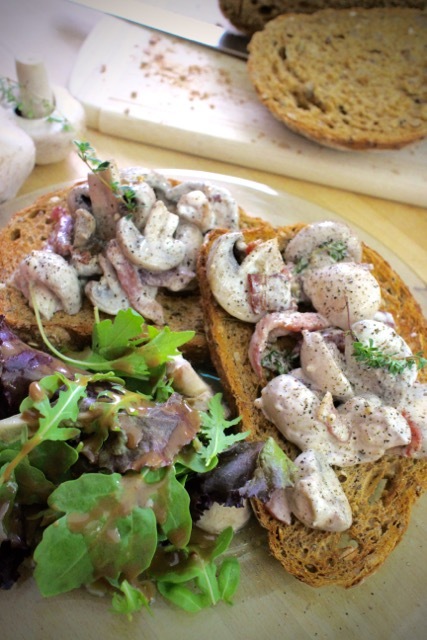 Serve the mushrooms toppled over the hot toast, with a pile of leaves on the side drizzled with balsamic dressing. 5. Eat quickly, whilst still piping hot! Sounds lush Kevin, I've never had mushrooms on toast so must try this! I wouldn't add the bacon, but the creme fraice is a fabulous idea and I always have some leftover when I made mushrooms sauce for pasta.